My research group is interested in understanding how post-translational modifications regulate protein-protein interactions and cell signalling. The main goal of our current research is to discover how the attachment of ubiquitin to proteins is regulated, and how this modification alters protein function. Disruption of protein ubiquitylation results in a range of diseases, including cancer and autoimmune diseases. As a result, there is considerable potential for development of new therapeutics that modulate protein ubiquitylation. Our research is focused on elucidating the features that regulate ubiquitylation of proteins that are of clinical relevance. 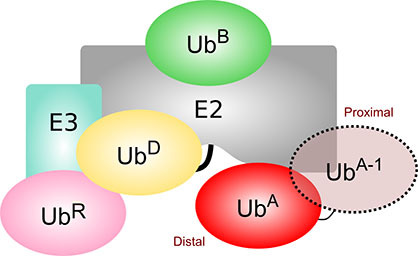 Understanding how E3 ligases promote the attachment of ubiquitin. We have a number of projects aimed at elucidating how RING-E3 ligases are regulated. For example we recently showed that Arkadia and Ark2C, two RING-E3, are regulated by ubiquitin itself. Revealing how ubiquitin chains are assembled. The ubiquitylation machinery contains many ubiquitin-binding sites (as illustrated in this figure) and we have several projects aimed at understanding how ubiquitin-binding enhances chain formation. We use biochemical, structural and biophysical approaches to understand how proteins are modified by ubiquitin. We are always keen to collaborate to understand how proteins are regulated by ubiquitin. Enquiries about projects from prospective graduate students are welcome and should be sent to catherine.day@otago.ac.nz. Funding for my research has been provided by the Marsden Fund (NZ), the Health Research Council of New Zealand, Lottery Health, Genesis Oncology and the University of Otago. Risk, J. M., Macknight, R. C., & Day, C. L. (2008). FCA does not bind abscisic acid. Nature, 456(7223), E5-E6. Mace, P. D., Linke, K., Feltham, R., Schumacher, F.-R., Smith, C. A., Vaux, D. L., … Day, C. L. (2008). 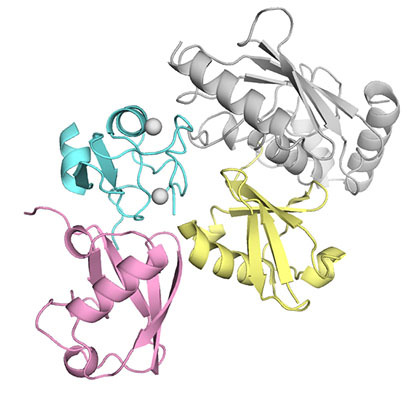 Structures of the cIAP2 RING domain reveal conformational changes associated with ubiquitin-conjugating enzyme (E2) recruitment. Journal of Biological Chemistry, 283(46), 31633-31640. Hinds, M. G., Smits, C., Fredericks-Short, R., Risk, J. M., Bailey, M., Huang, D. C. S., & Day, C. L. (2007). Bim, Bad and Bmf: Intrinsically unstructured BH3-only proteins that undergo a localized conformational change upon binding to prosurvival Bcl-2 targets. Cell Death & Differentiation, 14, 128-136.